Due to structural movement of the original stone built quayside at Greenore Harbour, and lack of available draught for shipping, to assist future expansion of the port’s facilities further deepening of the berths was provided along with reinstatement of the quay wall. Some 200 lin. metres of ‘combi’ wall was constructed and socketed into the rock bed by drilling and grouting and fixed back to a sheet piled anchor wall beyond the quay. A suspended slab was then incorporated to span from the original stone quay wall onto the top of the new wall, carrying dockside cranes. The wall is approximately 15m high to new dredge level, in approximately 10m depth of water. 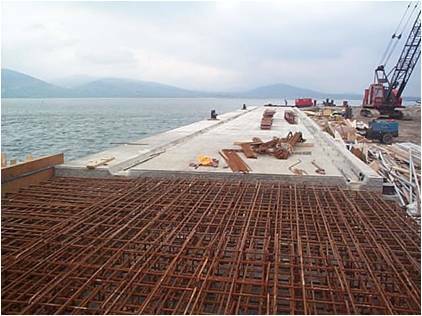 All concrete was designed for durability, and ladders and other marine equipment was incorporated. 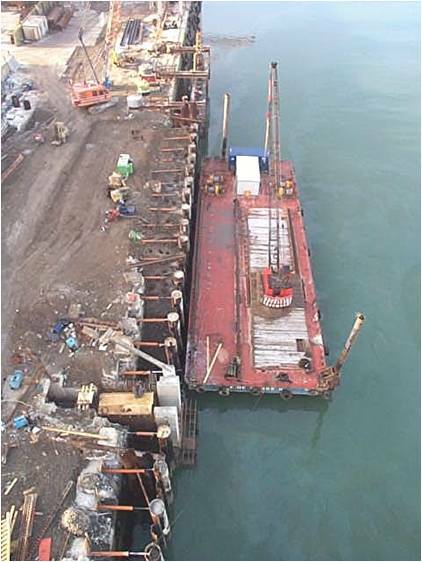 R G Parkins & Partners Ltd. were responsible for the structural design of the steel combi wall, including sheet piled anchor walls, ties, and the new surface concrete slab to accommodate the dockside crane.